Decorating for Christmas always brings the fondest of memories, don't you think? There is just something heartwarming about the gifts from others as you carefully remove the tissue paper you wrapped them in last year. Santas, carved wooden silhouettes, hand carved birds, feeders, seasonal signs and antique quilts all remind me of the days they were given and the special people who gave them to us. Christmas gifts from the past, regardless of how old they are, make that little "Charlie Brown tree" meaningful. Sweet memories and more to be made! Happy Happy and a Merry Merry! My decorations will go up next weekend when I have a couple of clear days to clean and tidy properly beforehand! That's what it's all about...the memories! It's why I have an aluminum tree....which I absolutely HATED as a kid...and bought as an adult. The memories. It's why I put up a real tree. When we didn't have the aluminum one, we had a real one. Mems...it's what it's all about. The memories are what it's all about and I am learning that especially as a young mother. Yes, it's the accumulated Christmas decor with memories attached that make the season heart warming. They are actually not things as much as tangible memories. Very pretty! The other day when I was decorating my tree I had the thought that it's not just a Christmas tree but a tree full of memories. Lovely memories and post.. The tree and decorations are pretty! Have a happy new week! You have some nice and cherished ornaments. Have a great week. Cherished ornaments represent lovely memories on the Christmas tree. Ours is a Charlie Brown tree and it's full of remembrances past. 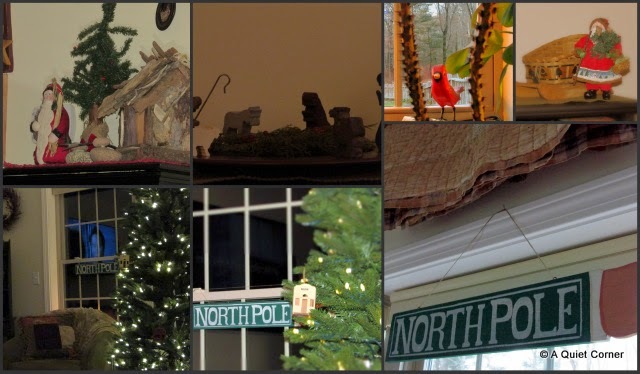 I love bringing out the decorations that have been saved and added to from year to year. I have some that my children made years ago. They still go on my tree. have a lovely lead up to Christmas. I am joining you over at Mosaic Monday. Christmas is such a wonderful time to reflect and to cherish memories.